How fit is your brain? When was the last time you worked out with a puzzle or word game? Most Americans are familiar with the benefits of physical fitness, but new studies show that brain health is just as important. According to the Center for Disease Control (CDC) Alzheimer’s disease is the sixth leading cause of death in the U.S. with an estimated 5.4 million Americans living with this debilitating condition. The hopeful news is that one possible prevention for the progression of Alzheimer’s is fun! People who exercise their brains by reading, writing, working crossword puzzles and/or piecing jigsaw puzzles are less likely to have the bad brain plaque seen in Alzheimer’s patients. Susan Landau, a research scientist at the Helen Wills Neuroscience Institute at the University of California, Berkeley, points to proteins called Beta-amyloid as the big baddies. The less the brain absorbs or up takes this protein, the better. Individuals who participate in more mind-stimulating activities had the least Beta-anyloid uptake. The key is to start young and keep going throughout your life because the study showed those individuals are the ones who where the healthiest. Dr. Landau explains that working puzzles is linked to overall cognitive activity that includes occupational, recreational and social activities that increase brain function. That is wonderful isn’t it? You can have brain fitness while relaxing and spending time with friends and family. This is where Bookmans can help. If it’s puzzles you want, it’s puzzles we have! In our Kid’s Corners, we have loads of beginners puzzles with all your child’s favorite characters. For the adults we have a huge supply of puzzles in all sizes, configurations and difficulties. For the outdoors type try the National Parks series including the Grand Canyon, which comes with a poster inside its own travel case. Puzzlers with a sweet tooth can work the Confections Series, which features brightly-colored, mouth-watering images of your favorite treats. Architects can try their hand at our 3-D Matchitecture build-as-you-go puzzles of such icons as the Eiffel Tower. 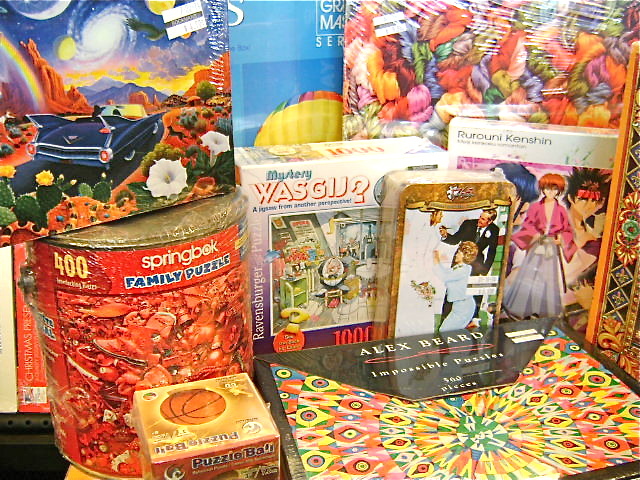 Mystery puzzles are plentiful and include games and clues to solve the crime, perfect for parties or for the family. Alex Beard Impossible puzzles are uniquely shaped to allow you to create designs of your own, easel included. Vintage, Photomosaics, textured grip, double-sided, Magic Eye of all skill levels are available. The choice is yours and you won’t believe the fun to be had with new styles, colors and shapes. Start a family tradition of good brain health while having fun and kiss those big bad Beta-amyloids good-bye! * Bookmans can not guarantee stock. If you are interested in a specific puzzle mentioned in this article, give Bookmans Speedway a ring at 520.748.9555, or check with your closest Bookmans to see what we have in store. Bookmans is the place to browse, but it’s a good idea to make sure the title is still on our shelves before you come in.